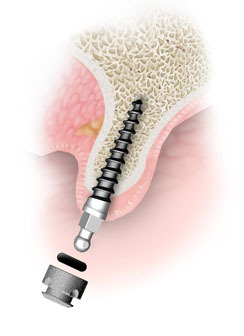 The dental implant procedure is a much less involved than it once was. For this reason, the procedure can usually be completed in a few appointments. In addition to saving time in the dental office, you will have far less discomfort (minimal surgery). Miniaturized dental implants, used for denture stabilization, are a relatively new technology in the dental product industry used by Dentists and Clinics to ease the discomfort and other problems associated with Dentures. These miniature titanium implants that act as the natural roots of your teeth have fixtures that are attached to your dentures. Without incisions or stitches in your gums, these implants hold the dentures or single tooth replacements in place. Much like a ball and socket, these implants are carefully placed in the jaw with the small head protruding, providing a strong and stable foundation for securing the dentures. Without the hassle and pain of typical lengthy recovery, patients who have received the Mini Dental Implants procedure can enjoy talking, chewing and ear-to-ear smiles just hours after installation! Mini Dental Implants have a wide variety of uses. I find more and more uses for this as a General Dentist. I think in a matter of time mini implant dentistry will become everyday dentistry. As routine as getting a filling. With 4 mini implants in place you can secure a lower denture. Even with a thin ridge most of the time these can be placed without cutting the gum. If the gum is not cut then no blood supply to the bone is disrupted. The bone heals faster around the mini implants allowing the patient to function with a implant retained denture immediately. The upper jaw bone is softer and not as dense as the lower jaw. As such, six mini implants are required to secure an upper denture. 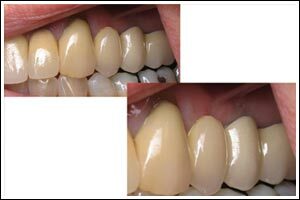 If you have a solid, well made denture that covers that hard bone at the very end of the upper arch you can remove the middle, or palate, of the denture, something which many patients appreciate. This horseshoe-shaped design allows patients to taste food better, have improved speech, gag far less (if at all) and feel more comfortable in general. With just a few mini implants you can take a lower partial denture and remove the metal clasp, fit the retention housing in the partial denture and now the patient does not have any visible metal on their teeth. If the partial is well made and has proper stops in the back of the lower jaw (retromolar pad) the partial will not settle and the implants will not get overstressed. Once again even with a few of these minis you can make a case that works. Over time if the patient's desires change and they want to add more its always possible. 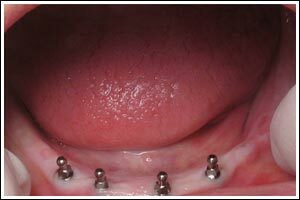 Here mini dental implants were placed to support 2 premolar crowns. They are the two teeth in the middle of the picture behind the large canine tooth. 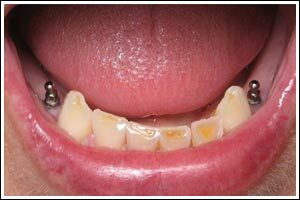 The last tooth in the picture is a crown on a natural molar.